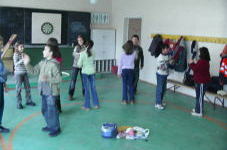 In the winter, classes take place twice a week in the school gym or in the classroom. 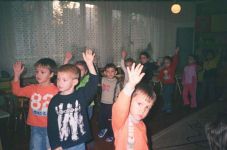 Children study the physical exercises, text and songs of Paneurhythmy. 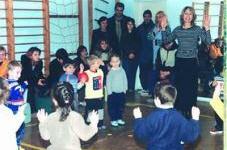 With the help of musical and dynamic games children improve their coordination and sense of rhythm. Special attention is paid to body positioning and the feelings of the body while making the exercises. 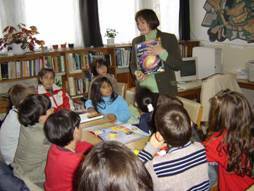 The group work focuses on friendship. 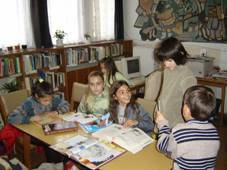 In order to enrich the imaginations we tried a trip to the books and the internet upon texts of Paneurythmia in the child’s department of the town library, Dimitrovgrad. 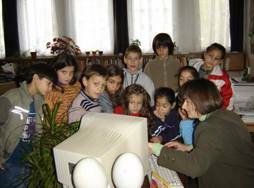 It contains encyclopedias in all spheres of science, a DVD, a video, a cassette recorder and a computer with a constant internet connection. The children could explain to themselves vividly from the encyclopedias the processes which take place in the human body when we do exercises of paneurythmia. They got aware of the condition of the brain when it sleeps and when it wakes up. To understand the awakening of the day, the children had a look at the atlases of the World and the Universe. 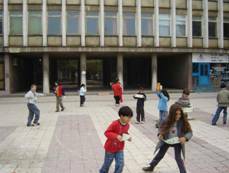 The game in which the Solar System was performed, where every child plays the role of a separate planet and goes around the Sun and his own axis at the same time appeared to be a very interesting performance. We carried into awakening of the different civilizations which had left their knowledge on columns and murals to reach what our ancestors had left to us; the mammon of the folklore with wonderful songs, myths and legends so that we know and succeed better today. We didn’t miss the theme about dinosaurs which is beloved of children from all ages in order to come to the abilities of the animals we can see today and to bind them with the exercise called “Jumping”.